This post is heavy on philosophy and the reasoning behind why we’re doing what we’re doing. If you prefer, you can skip to the details of the new support system. What’s wrong with support points? The easiest, most objective point to discuss is that support points are a huge money loser. We’ve done the math and the cost of answering the average support issue is almost $25.00, but the average revenue per support ticket is just under $1.00. The absolute numbers are also horrible. For December, we’re on track to make about $75 on the sale of support points. Total. Worse yet, not all of those support points have been used. So that model doesn’t even remotely cover the costs of providing support. The difference continues to come straight out of the budget for operations and R&D, which is unfair to the rest of our membership that isn’t using support. A fairly large contingent of the users of support points also seem unhappy with them. It combines all the fun of being nickeled and dimed with the pleasant surprise of finding out you have to pay extra when you’re probably already having a problem. Many people have expressed their disapproval of this system, often having to resort to profanity and personal aspersions to convey fully the level of disdain they have for it. The people who provide support don’t like support points either. Not only do they feel pressured to underreport the amount of time they spend on issues but they also feel obligated to keep the member’s cost down by providing the fastest, shortest responses possible. Neither of those is conducive to providing good support. So, we have created a system that loses money, alienates people, and encourages poor results. Any of those would be enough reason to ditch it, but all three together, whew, somebody’s going to have to admit that they were wrong and that support points were a bad idea. Unfortunately, it looks like it’s me. I was wrong. Support points were a bad idea. Our core members are in the checkmark box. Historically, fewer than 20% of our members have ever contacted our support for anything — system problem reports, email feedback, free assistance requests, anything. The number that has ever needed to pay for support is even lower than that, down around 5%. That means 80 – 95% of our members don’t use support. These members maintain a casual interest in what we do with support, in case a crisis ever comes up where they need it, but by and large it doesn’t affect them. To design a paid support system that suits them, we just need to make sure that people who don’t want it don’t get charged for it. So any plan that proposes to charge most of our member base for support they don’t want and aren’t using is DOA. Then there’s the “X” box, people who want support but aren’t willing to pay for it. That is not a customer base that tends to be happy with our service. So long as our company is based on a “pay for what you use” philosophy — in other words, always — there is, essentially, nothing we can do about that. So we’re not going to try. One of the common sentiments we hear from people in that fourth group (usually on their way to becoming ex-members) is some variation of “I don’t want a host that charges for support!” This is, of course, nonsense. Every web host everywhere that provides support charges for that support. The people who provide support get paid to do so. The people who provide support when those people are sick or on vacation get paid to do so. All those people need training. There’s support infrastructure, like a ticket system to buy and/or maintain. Etc. All these things cost money. Lots of it. We’ve already established that, for us, charging the 80-95% of our members who don’t need support extra so they can subsidize the small fraction of members who do is a DOA plan. (And would probably be suicidal for us as a company given that getting away from that type of charge is why an awful lot of those people are here.) The fact that doing so is the industry standard couldn’t be less important to us. Ok, it’s not free, but why does it cost that much? At least once a month, I get spammed by some company in a foreign country telling me that I can outsource our support and get 24×365 coverage for $900 a month or so. Yet here I am saying that answering the average support issue costs us $25. Clearly we must be horrible at this. Well, maybe. Going that route is definitely something we could do. But I recently had occasion to contact Amazon customer support, and if you need a good reminder about why we never will, just try that. The practice of scanning messages for keywords and sending stock answers that have nothing to do with what was asked because that’s the only option the barely-qualified person has is alive and well. And that’s exactly the kind of support a web host can get for $900/month. In my opinion, if we can’t do something well, we shouldn’t be doing it. That’s, for example, why we don’t offer email hosting. And what disappoints me so much about support points is the way they work against that goal; over time they shifted the emphasis from good support to cheap support, to everyone’s detriment. The primary factor working against us is volume. We’re not the world’s largest web host in the first place, and when only 5-15% of our members ever need help at all you can reasonably expect that we’re not exactly running a huge call center here. The result is that we need really high quality people to answer questions, but we don’t need them very often. And no matter how high quality they are, we still have to train them, they have to stay up to speed on everything that happens on this blog, our forum, every development of our service, etc. All that overhead adds up and when the volume of support is low, it drives the per-issue cost through the roof, even if the actual time spent on an issue is minimal. So what do we do about all of this? We identify the objectives of a support system and then design a system to meet those objectives. The first two objectives arise from the core philosophical principles outlined above. We either provide good support or we do not provide it at all. Paid support must be opt-in. Paid support must be self-financing. Anytime it isn’t, we’re not just losing money on it, we’re also necessarily failing at the “opt-in” objective, because all our money comes from our customers so the difference has to come from someone who didn’t choose to pay for support. Unacceptable. We could start charging $25 per issue, but I feel pretty sure that in practice that would turn out to be “no support” wearing a fancier suit. The key realization for us was that responding to an individual issue is a relatively small component of the cost of providing support. 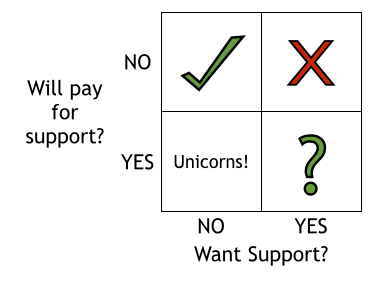 Essentially, if you want support, you’re not really paying for the answer to a question. You’re paying for somebody who knows what the heck they’re doing to be there when you have a question. Charging $25 per-incident for support would be like giving away a free ice cream sundae with each purchase of an insanely overpriced cherry. So that’s why we’re moving to a subscription model. Our goal will be to leverage regular payments to bring the cost down a at least a little, and potentially a lot by allowing us to plan better and farther in advance for how much support we know we’ll be providing. To one way of looking at it, the subscription model is a sort of “support insurance.” You pay a monthly premium and then the subscription covers the actual cost of providing support when you need it. The support subscription starts at $5.00/month. If we get about 1.5% of our members to sign up for it at this price, it should cover the costs of the support we are currently providing. But let’s face it. If 16 people sign up for this plan, we’ll still be better off than we are now. Like a lot of our other services, support subscriptions will be billed daily. Unlike most of the rest of our services, they pre-bill 31 days in advance. So if you sign up at midnight on January 1st, you’ll be charged $5.00 for the first 31 days. Then, over the next 24 hours, you’ll be charged about $0.16 for February 1st. And so on. Once your support subscription is active, you’ll be able to open support issues. We, in turn, will schedule people to answer those issues based on how much support the subscribers are paying for. But wait, you say, some people will wind up using a lot more support than others. If they all pay the same amount, isn’t there a fairness issue? Potentially, yes. Since we’ll be using the subscription to make sure people are available for a certain amount of time, we’ll provide as much support as we can during that time, even if it’s to the same people. And although a lot of the cost is fixed, the variable part is not zero. As with any flat-fee service, there will be some people who will treat it as unlimited, asking every question they come up with rather than doing research in our FAQ or forums, for example. So it’s possible some people could wind up getting more than their share of support. Since we’re talking about a service of interest to maybe 1-10% of our members, it’s probably not going to matter much because we don’t expect so many people to subscribe that those types of outliers will be disruptive. The primary case we need to protect against is the one where people using more than average “starve out” people who need only occasional help. To guard against that and help ensure fairness, we have also built in an additional factor. We’re still going to track how much time we spend on each subscribed member, we just won’t use it for billing purposes. Instead, the main factor that will be used to prioritize issues will be the length of time you have been a support subscriber divided by how much support you’ve used. That way, people who use more support will find themselves prioritized behind people who use less support. In a nutshell, during times when you aren’t using support but someone else is, you’re effectively paying for priority handling down the road. If you stay subscribed for months without using it, when the day comes that you do need support, you’ll probably go right to the front of the line and get an answer very quickly. And where possible and appropriate, your support subscription history will enable us to spend much more time on that answer than the old support points system would have allowed. In contrast, if somebody is using support as fast as we can provide it, that person will rapidly find themselves relegated to the time left over after everyone else is taken care of, which might mean getting an answer only every day or so. How much support they use in aggregate. How much support you have used in the past. How long you’ve been a support subscriber. We’re also pretty smart and conscientious, and we want this system to work. So if a few people do wind up trying to take advantage of a flat-fee support subscription in a way that might be disruptive to others’ ability to get good support, we will see it and take appropriate action. What does “starts at” $5.00/month mean? If this program becomes very successful and sees much higher adoption rates than the minimum we need for it to succeed, we will be able to lower the price, possibly significantly. Because we’re us, we’ve built that possibility into the system as an automatic feedback loop. $5.00/month is the upper limit. We’ll base the actual charges on historical usage so if a ton of people sign up and the average amount of support per person goes down, so will the cost. And to some extent, more subscribers will mean lower costs per subscriber even if the average support per person doesn’t go down, just due to economies of scale. We’d love to see the cost down around $0.50/month, although that might be farfetched. Since more subscribers will make prices fall, we don’t want to create an engine stall by inadvertently encouraging the people who would make prices fall wait to sign up until prices fall. Once people subscribe, we want to encourage them to stay subscribed; that’s much easier for us to plan around. Although there is a distinct response time benefit to subscribing before you need support, we do expect that a nontrivial number of people will wait until the first time they need support to subscribe. Leaving the first month at $5.00 helps protect us in that scenario. What about the existing free support options? A huge amount of free support will continue to be provided by the amazing volunteers in our forums. We’ll still have the FAQ and wiki for people who want to help themselves, and free assistance requests and system problems reports where appropriate. Some combination of those mechanisms will remain the best avenue for people whose support needs are limited to needing an occasional nudge in the right direction. Over time our support system has evolved into a fairly complex tool from which you can get good results if you use it exactly right. But it’s also a tool with a lot of sharp edges and a bad reputation for cutting people who grip it incorrectly. (Mainly by sending them email telling them they did it wrong and to start over.) So we’re taking some steps to fix that. We can now accept support issues via email, provided you send them from the exact address associated with your membership. To make sure the email is genuine, you will be asked to log into our system and confirm the issue before we address it. We also now have the ability to convert issue types. For example, we accept free system problem reports from any member. However, most of these reports are about things that aren’t really system problems. Now (if you’re a support subscriber) you aren’t stuck with the “Not a system problem” auto response; we can auto-convert it to a regular support issue and tell you what it is is. Likewise, if you submit an assistance request of the wrong type, you no longer have to get an email telling you to start over. Instead, you get an email telling you that we converted it (so you’ll know for the future) and then we carry on. We can also combine these features, so if you send in an email that can be handled by a free assistance request then even if you don’t have a support subscription we can convert it, have you confirm it, and get it taken care of. And if you would like to sign up for a support subscription, please visit our member interface. After a month and a half with the new system, we will be making a couple of tweaks. We found that over 70% of people signed up for non-renewing support subscriptions, and even more than that requested support the same day they subscribed. We knew some people would do that, but we didn’t think it would be that high. And when most people are paying a fixed fee of $5.00 for a support issue that is costing us much more than that to handle, the trade-offs necessary to close the gap still won’t work. Support subscriptions were intended to be a long-term decision (hence “subscription”), not something flipped on and off as needed. Effective today, the minimum term of a support subscription will be five months. As a result, support subscriptions will cost $5.00 to set up and “up to” $5.00 per month. (The meaning of “up to” remains the same as before.) This means that the first five months of a support subscription costs $30, the second six months cost $30, and by then “up to” should kick in to bring the cost down even more. Early adopting renewers will continue as-is; essentially they got the setup fee waived. They will also be able to disable renewal without waiting five months, although I bet they don’t… they seem pretty happy. Current non-renewing subscribers will receive the 31 days of support eligibility they paid for, and if they convert to renewing before that runs out, they too will get the setup fee waived. We are also exploring additional ways to handle those few rare cases where people need support they can’t get via the forums but genuinely can’t afford a subscription. How does this work for the transitioning people still with support points? I checked just now and it says I have a support subscription (which I have not yet signed up for…yet) but I do still have quite a number of support points available–not sure how much since that number doesn’t show anymore. All in all, a subscription model seems more in line with support offerings. Afaik, most enterprise support packages are subscription-based and it works really well for them. In the past, I’ve only used support maybe 3 times. I found the point system confusing because I had no way to predict the cost of the support. The subscription model is much better in that regard. I am running a business here. To me, all of my support issues are highest priority because my income depends on the website being available. I can’t wait until I need support to sign up it. The priority system that you’ve outlined is well thought out. I like it. I read some of the post, not all of it. I fully “support” this support model. Great job on always improving system. I always thought that the support points system was a bit fishy. Surely it cost more than $1 per point to investigate and/or fix an issue. This retainer model is very good, and the retainer fee is quite modest (unlike, say, the retainer fee of most lawyers). 🙂 I hope everything goes well. I like it. I think it’s a great solution. I’ve never used support points so I don’t think I’ll be signing up just yet. I assume you thought about a priority support subscription for those that use a lot of support and decided against it, or maybe you have other plans for those people. What you are paying for with a support subscription is the peace of mind of knowing that if you have questions, someone will be there to answer them. And as outlined in the blog, when you’re not using it now, you’re paying for priority later (which sounds like exactly what you would want if it hits the fan). Nothing about that is “wasted money.” But if you disagree, that’s fine. Nobody’s forcing you to buy it. At least, not here. The type of “emergency support” you describe is not something we’ve ever provided. Some of the facilities we use do offer that type of emergency help. It costs $150 – $300/hr with a half hour minimum billed in 15 minute increments. It’s not dissimilar to how a plumber works if you have to call them out to your house right away because the toilet is overflowing. It’s expensive, but when you need it, you need it. Maybe that’s a service we’ll offer in the future for situations like what you describe, but if we did, I don’t anticipate it would be very popular. In the mean time, if you want help on a per-incident basis, you do always have the option to do a $5 one-month non-recurring support subscription. You won’t get the fastest response time that way, so it’d be a bad choice for somebody whose site was crucial to their livelihood, but if your site is a labor of love with the limited budget that tends to entail maybe that is a good trade-off. My support needs have been mostly limited to “it’s broken” (e.g., my logs stopped), or “root has to do this” (SSL certs, chmod on files inside directories owned by web). The tone of this post suggests to me that you’ll now respond only to “it’s broken.” Other currently free requests, such as things “root has to do,” wouldn’t be breakage and would require an active subscription. The forum is a great resource, but of course nobody in there can su. It strikes me that this makes NFS more usable for people to need support, which may increase the costs. I can think of people to whom I can say, “you can use NFS< but sign up for the support". On the other hand their issues are likely to be easier to solve than your current user base's and they will probably not make many requests (as long as their site does not fall over). I think the best solution may be what I have told one person, which is "use NFS but come to me when you need support" which has worked fine for a few years now. This could work even better if you could provide an enhanced version of adjunct access to a site: perhaps even adjunct access at the account level. I support this decision. Hehe. Very nice – while I will not be buying support at this time, I do really like the setup. Keep up the good work! Anyhow, this is great, and thank you for the continuing great service. As always, your honesty and transparency is staggeringly refreshing and invigorating. Thank you. it’s awesome how transparent we get informed. thank you. It’s heartening to see not only your transparency, but also the amount of thought you have put into this. For me a $5 starting subscription is not really needed since I have not contacted support so far. But over time, if you end up reducing the “sign up” fee (and the subscription fees), it may appear more attractive. Support in general is expensive, I suspect that most people that gawk at the $5/month starting pricetag don’t really grasp this. You don’t need to have worked in customer service to understand that fixing your own computer or car can save a lot of money. The same goes for your own website. You guys are the best _business_ I’ve known in transparency and integrity. I really would pay more for the base service if you asked. The quality here is that exemplary. Could you give examples of what would come under paid support? – A question about how fast aliases can be moved between sites. – Figuring out a problem with colliding MySQL usernames that kept locking a person out. – Help configuring a site’s aliases and canonical name settings for best compatibility with SSL. – Why is my site so slow? – Help figuring out a way to delete files from specific folders automatically at specific intervals. – A question about ICANN’s new whois data accuracy project and how it affects that member. – Help figuring out 500 errors caused by an old .htaccess file under Apache 2.4. – Help figuring out why DNS set up at a third party provider is breaking email forwarding. I marked with a * the two where the person pretty much had to have a paid support subscription. In all the other cases, the person had another option (searching/posting on the forums, digging around online, experimenting) but chose to utilize our paid support. I can’t speculate about any individuals motives, but lots of times the alternative is tedious or time-consuming, and our goal is for paid support to be a faster, easier way. Also, one of the above cases started out as a free assistance request, which would have failed with an automatic error message, but because the person also had premium support, we were able to convert it to a support request and get them to the result they wanted.